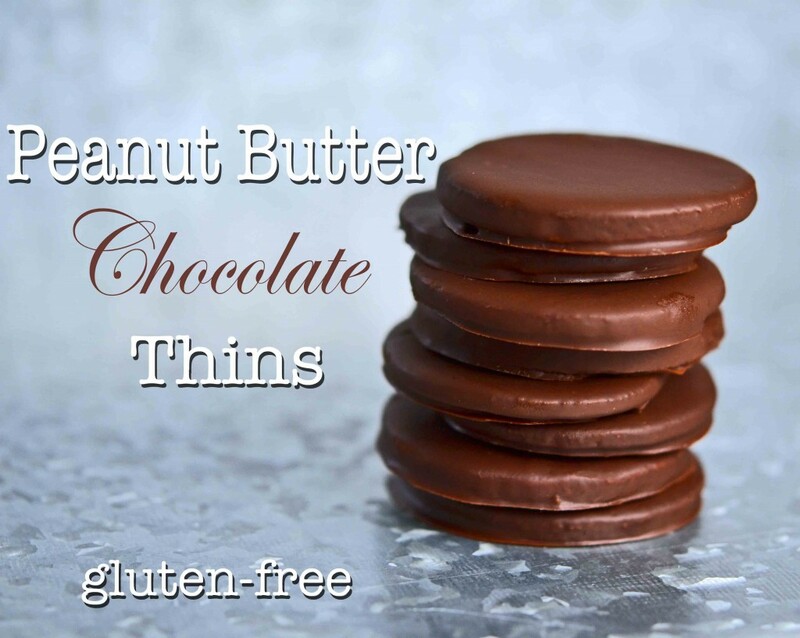 Peanut Butter Chocolate Thins Cookies | Great gluten free recipes for every occasion. I always wished I had a sister. One like the sort of sister that each of my two girls is for the other. There’s even research showing that having a sister makes you a happier person, whoever you are. I didn’t dream about a big wedding, or getting married or anything at all like that. But I wanted a puppy (one that fit into my pocket would have been the puppy of my dreams, so I could bring him everywhere without anyone telling me “no”). And a sister. Is it weird that I never even told anyone either of those things before? Don’t answer that. Okay, tell me. Wait, don’t. When my two girls, who are my oldest and my youngest children with a brother in between them which seems to cancel out most of the expected sisterly rivalry, eat sweets that they love, eating them together seems to multiply their happiness by, like, 100 times. The two sisters in my house? They love these chocolate-covered peanut butter cookies. These cookies are like peanut butter gluten-free Thin Mints. They’re both thin, and covered in smooth rich chocolate. But instead of mint, it’s roasted peanut butter. 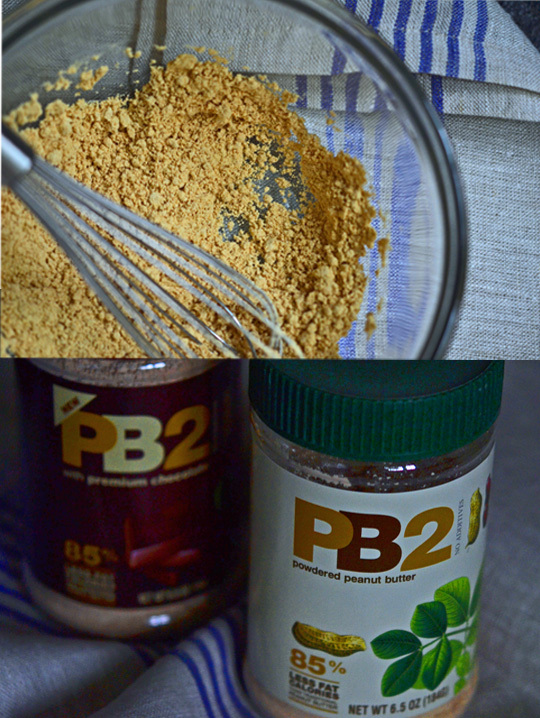 PB2 is this pretty cool powdered peanut butter (and yup, it’s gluten-free – I asked). I have taken to using it like I use cocoa powder. Sort of. So far, I’m pretty well loving it. (There’s a link to PB2 on amazon in the printable recipe below.) I also love sprinkling it on plain yogurt, and using it to make smoothies. This dough is pretty easy to handle. It’s smooth and pliable. If you like, you can divide it in 2 parts and wrap them each in plastic to chill them for a bit before rolling them out between layers of unbleached parchment. All that’s left is to line them up. And then dip them in some nice dark chocolate. Let them set, and then enjoy them with your sister if you have one. Or your brother. Or alone long after everyone else has gone to bed. That can be a pretty happy experience, too. So I’ve heard. In a large bowl, place the flour, xanthan gum, PB2, sugar and salt, and whisk to combine well. Add the butter, egg and vanilla, and mix until the dough comes together. It will be thick and smooth. 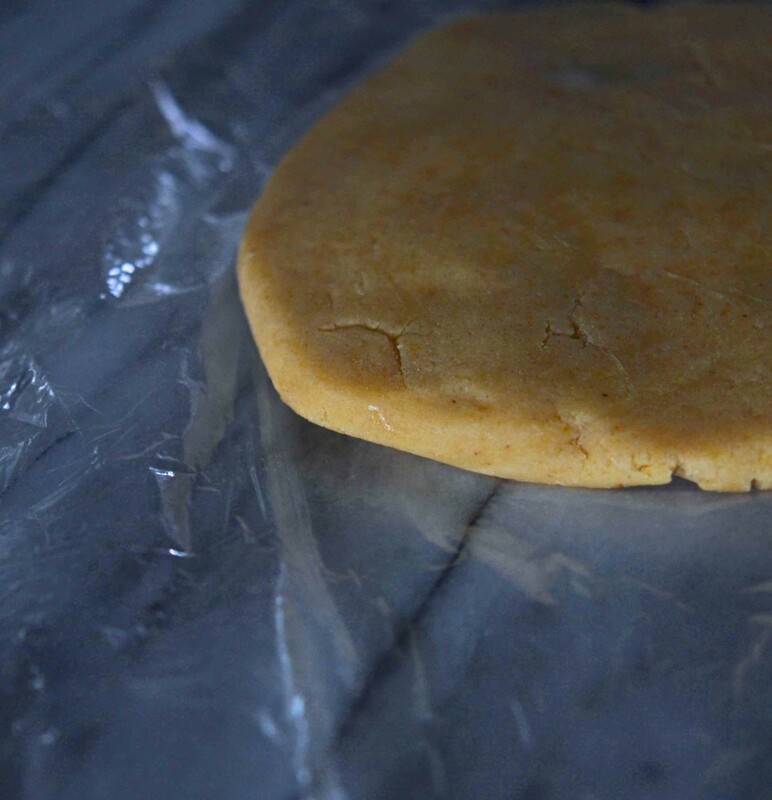 Divide the dough into two equal parts, and roll each out between two sheets of unbleached parchment paper until the dough is 1/8 inch thick (the thickness of a nickel), no thinner. Pull back the top sheet of parchment paper on one piece of dough. With a round 2 1/4-inch cookie cutter, cut out rounds. 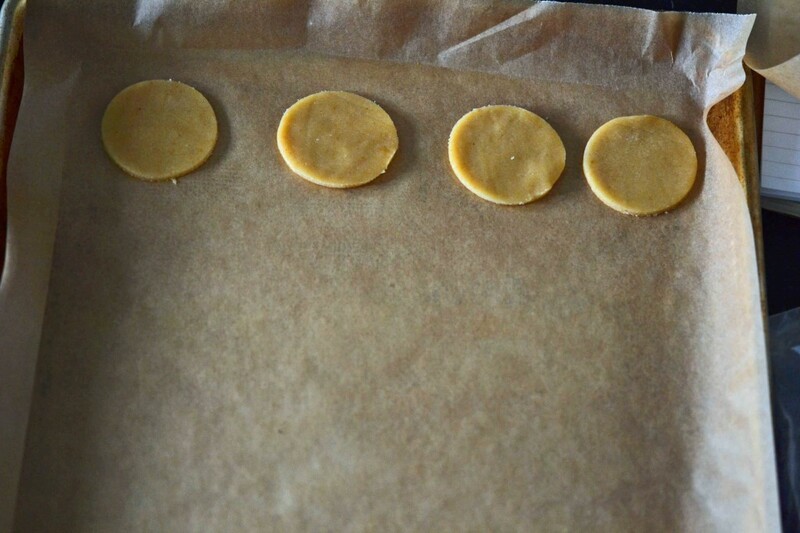 Transfer the rounds to the prepared baking sheets, and place them about 1-inch apart (they will not spread much during baking). Gather the scraps, roll them out again, and cut more rounds. Repeat with the second piece of dough. Place the baking sheets, one at a time, in the center of the preheated oven and bake, rotating once during baking, for 8 minutes or until golden brown around the edges and light brown on top. 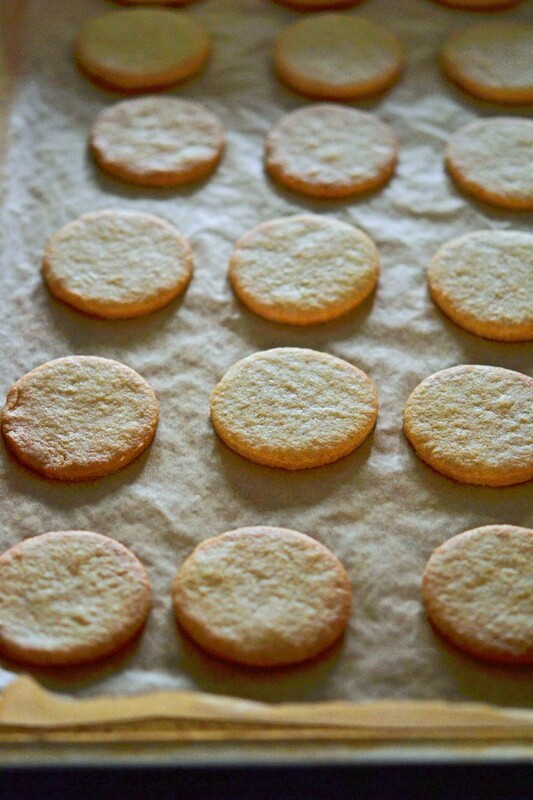 Remove the baking sheet from the oven, and allow to cool on the baking sheet until firm. Transfer to a wire rack to cool completely. Once the cookies are cool, make the glaze. Place all of the dark chocolate except for 3 to 4 1 1/2-inch-size chunks in a medium-size, microwave-safe bowl. Microwave at 70% power for 45 seconds at a time, stirring in between, until melted and smooth. Add the reserved chunks of chocolate and stir until the chocolate has begun to thicken a bit and the chunks have melted. Place the cookies, one at a time, in the glaze. Press down on the cookie with the tines of a fork, then flip it gently in the chocolate. Pull the cookie out of the chocolate by slipping the fork under it and bobbing the cookie on the surface of the chocolate a few times before pulling it along the edge of the bowl and carefully placing it on a clean sheet of parchment paper. Allow the chocolate to set at room temperature. P.S. If you haven’t yet, please pick up a copy of My Cookbook. I really appreciate your support to help me keep the blog going! Not only do I have a sister . . . but I have 6 of them!! And it is great :). Is it possible to use ground peanuts instead of the peanut butter powder? Would it taste & turn out the same? Ground peanuts are a very different ingredient than PB2, Mai. It would not be the same recipe at all. Feel free to experiment, though! I had sister dreams too, but alas all I got was an obnoxious younger brother. I used to ask my mom if she would please have another baby so I could get a sister and she used to laugh and say, no way. Only now that I have 2 of my own do I completely understand :) though the idea of my big girl having a little sister (in addition to the brother, like your girls) is pretty sweet and *almost* tempting! But until I sleep a full night that is out. In the meantime, these cookies look amazing. Love the idea of powdered PB! I’m not kidding. I just ordered pb2 from Amazon last week and it arrived today. Coincidence? Miracle? You decide. I have never outgrown pb&j sandwiches. Love peanut butter and these look great. I am so glad to see a recipe using PB2. I also get this from amazon and mix per instructions and put on Quaker rice snacks. I personally love this stuff and feel good about it being so low in fat. I wish I would have found your blog earlier as I love Better Batter also! Can’t wait to try these. These look fabulous. Do you have any tips for dipping them into chocolate so it isn’t a big chocolate mess and coated too thickly? Have I mentioned that I am “baking” challenged? I didn’t know they made powdered peanut butter. Who knew? How cool! Sisters, ah. Well, my sister and I are 2.5 years apart so we did have some rivalry. We get along now for the most part but I bet your girls will be friends as adults. They may have a rough patch when the oldest starts going out with her friends and such. After that though, “all good” is my bet. I give pretty detailed instructions for dipping them in chocolate in the printable recipe. 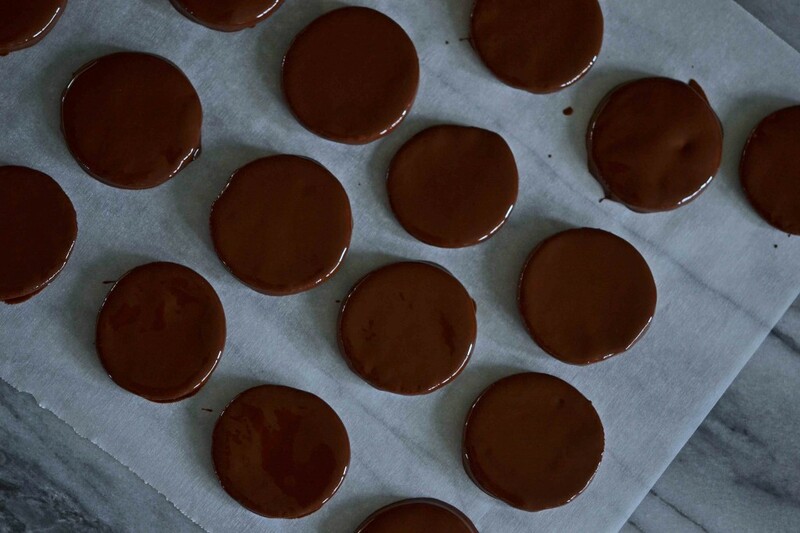 If you’d like to see some process photos for that, I suggest consulting my recipe here on the blog for gluten-free Thin Mints, since it uses the same process. If my girls didn’t have a brother in between I’m sure there would be lots of rivalry. Or, if they were closer in age than their 3 1/2 years apart. I bet it will be very hard for the little one when her big sister starts going out with friends without her. Good point – I’ll watch out for that! Ah! Ok, will try that! I’m afraid you can’t substitute regular peanut butter in place of the powdered stuff in this recipe. It has completely different chemistry. I would suggest trying my recipe for gluten-free Do-Si-Do-style peanut cookies instead, if you can’t have PB2 (although I’d check to make sure PB2 actually has corn in it before deciding). My daughter came in and saw the recipe up on my laptop and immediately declared that we make some. so we will. Thank you for your yummy and innovating recipes! I’m so excited for your new cookbook! I hear you, Jennifer. And although my daughters have now what they have now, there’s no guarantee they’ll keep it going into adulthood. But a mom can dream! Thank you for enthusiasm about the new book. I can’t wait for you to see it!